In the morning of 27th February, a visitor from Hong Kong won the progressive jackpot of HK$3,437,856 with a Royal Flush at the Caribbean Stud Poker table on the first floor of Grand Lisboa. 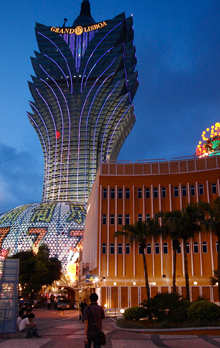 In January 2010, there were two big jackpots won in Grand Lisboa. Those two winners won the Royal Flush Progressive jackpot worth over HK$7.4 million at Caribbean Stud Poker. Grand Lisboa offers more than 700 slot machines and over 300 gaming tables where guests can enjoy a variety of games. The famous Crazy Paris Show and Tokyo Nights provide performances in Grand Lisboa everyday. Furthermore, the property offers 430 ultra-luxurious rooms and suites, state-of-the-art meeting facilities and banqueting facilities, a fitness centre, swimming pool, spa, outstanding food and beverage facilities with Michelin-stars awards.